Much of Alaska is wild, cold and unforgiving terrain, but deep in this harsh landscape, incredible gemstones can be found. From amethyst in the upland regions of Tok and Northway to raspberry Wrangell garnets in the south, Alaska is rich in gemstones. Some are rarer than others but all are beautiful. A delicate, lavender-colored variety of quartz, amethyst has been found in the granitic uplands regions of Tok and Northway, Alaska. The crystals are light pinkish purple and are found as single crystals or parallel growing groups. They are typically found growing in pegmatite pockets of quartz and weathered feldspar. This stunning, deep pink gemstone's name comes from the Greek word for rose. Crystals have been found near Tok, Alaska, and north of Kantishna, Alaska. Mined at Green Monster Mountain, these epidote deposits were formed by an intrusion of magma into lime-rich sedimentary rock. Epidote crystals are black, doubly terminate and can be as long as six inches. They are highly prized by collectors and museums. Garnets from Wrangell in southeastern Alaska are prized for their deep raspberry color and their unique octagonal shape. The Wrangell garnets are the almandine variety because they are comprised of iron and aluminum. While the imperfections in the stones make them unsuitable for gemstones, they are prized by collectors for their shape and color. They occur about six miles north of Wrangell on Garnet Creek at the mouth of the Stikine River. Nephrite jade is mined in northwest Alaska in the Kobuk River region of Jade Creek and Jade Mountain. Archaeological artifacts, hundreds of years old, have been found at these famous nephrite jade occurrences. First discovered in 1886, the site was extensively mined from 1943 to 1945 for jade and asbestos to aid the war effort. Though the quality of Alaskan nephrite jade is variable, the site remains an important one. On northern end of Kuiu Island are veins of fluorite that intrude into the Cornwallis limestone also found there. Although the veins are mainly quartz, green or purple fluorite can be found. Crystals can be either cubic or octahedral. Rutilated quartz is found in the Nolan Creek drainage in the Brooks mountain range in northern Alaska. They can be found in vugs (cavities in the rock) or fissures in various metamorphic rocks in the area. The clear quartz crystals contain rutile needles (inclusions of titanium oxide) ranging in color from reddish copper to brown. 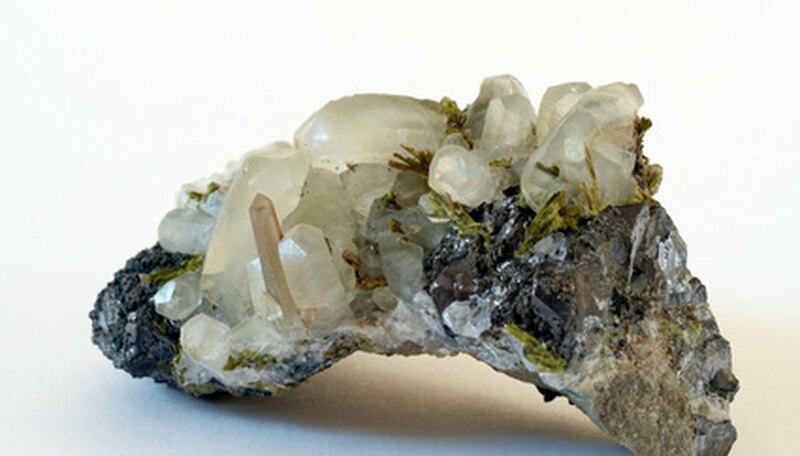 Crystals can be found with rutile needles included or growing out from the crystals.